Fossil has announced a bunch of new colour-ways and designs at Baselworld 2019 – but none more striking than the Fossil Cameron, a new women's hybrid smartwatch. 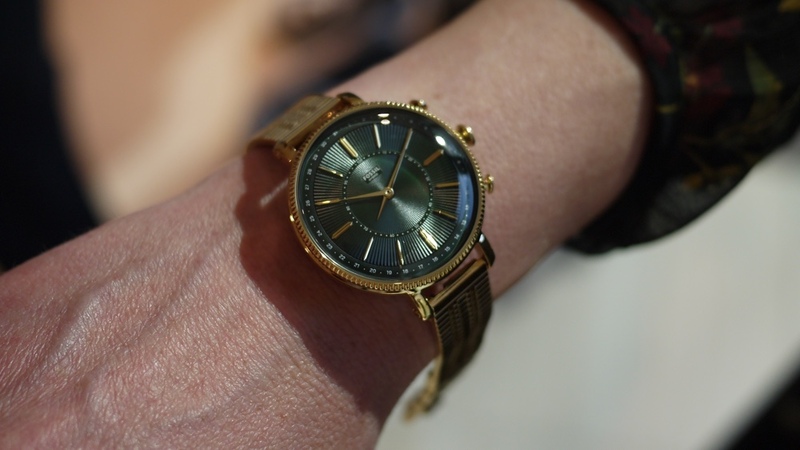 In a show that’s been more about harking back to Fossil’s roots with the 'dumb' Archival line-up, the Fossil Cameron hybrid boasts a sleek gold and green look that’s bang on trend, with a slim design that no-one would ever guess packed hidden smarts. The Fossil Cameron features a 36mm case that takes a 14mm strap – and that’s an all-new design here, too. There’s nothing new in terms of technology here, but the Fossil Cameron boasts the same activity and sleep tracking as its Fossil stablemates. It will also tip you off to incoming notifications, which can be customised in the Fossil app that's available on both iOS and Android. But Fossil has also been busy adding new colour-ways and designs, as well. The Fossil Jacqueline has a new tortoise shell acetate option, complete with the same style link strap as Cameron. It also comes with a 36mm case with 14mm lugs. There’s not too much else going on around the Fossil Group in terms of technology at Baselworld, although new strap options for the Skagen Falster 2 caught our eye (see below) along with some new hybrid colour-ways. Elsewhere, the Diesel On is getting more weather effects as part of an update to the micro app. With Baselworld mirroring the decline of the traditional watch market, Fossil isn't revealing much news at the show. The company has become more tech savvy, saving its releases for the September window to take advantage of the holidays.